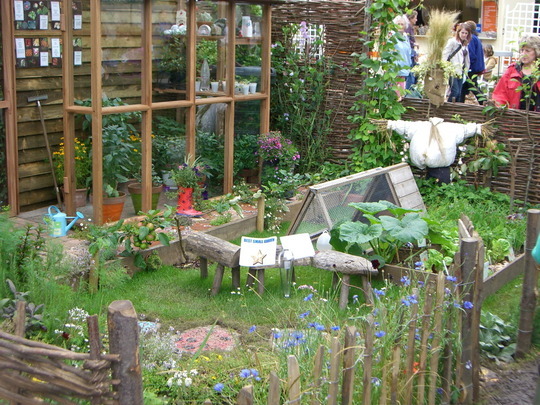 The Alton infant school entry - "Learning to look after our world"
This whole garden was designed by school children. Apparently 'the children decided what to put in it - that's why it is so packed'. Really inspiring - here's to the gardeners of the future! looks familiar to me... the more the merrier. Children know that. lol. What a great idea! When I was in infant school every child had their own tiny garden that they could plant whatever they wanted in. I'm sure that helped make me a gardening enthusiast! I still remember I planted antirhinum seeds in mine and was amazed when they flowered. What a lovely idea and what clever children - they will get a lot of fun out of this I should think.